You might think I'm mad but...: We [are] sharin' all we've got! We [are] sharin' all we've got! In my second school, my 2nd graders' home room teacher is an older man, nearing retirement. He doesn't have much of a "get up and go" attitude and so when the students come to my class they tend to be a wee bit hyperactive and silly. Thankfully, despite the silliness they are really well behaved and really like to have a chat and participate in class. Granted, much of the chat is held in Korean with a dash of English, and I have to guess what they are trying to say...but we get there! Like last year, we are concentrating on phonics. At the moment we are reviewing the alphabet but will start reading CVC words soon. Some of their favourite games to play are when they make a line, and I say a sound or word and they have to identify the correct starting letter. They can so dramatic when they guess incorrectly! They try to have two or three turns to guess the right letter! My favourite time is when I give them a word or sound like a BPVF sound (all are very similar in Korean) and it's not a word they know, like fish. Instead I will say something like "Facsimile". It usually takes a few students to figure out the right letter! (So in case you are wondering, they don't need to know what any of the words mean the key is recognising the right sounds.). The class is split between 5 boys and 3 girls. And, let me tell you, the competition is fierce! One of the girls and two of the boys really know their stuff. They try to out-do each other all the time. Despite the competitiveness, the kids are really sweet. They help each other out and race to be finished with their worksheets. Whenever they can they try to use their minimal English to tell me about themselves or whatever is going on in the class. For example, recently, I wore earrings to school for the first time (in case you are wondering, my ears have been pierced since 2001). The second grade girls were completely enamoured and kept saying "beautiful" so I taught them the word "earring". (Actually side story - since I've started wearing earrings to school, I've been called beautiful a lot more often by my students. It makes me wonder what I look like without them on!). The following week, I met them before our class and the three girls started to point out their earrings: Stickers of flowers, diamonds and hearts adorned their ears. 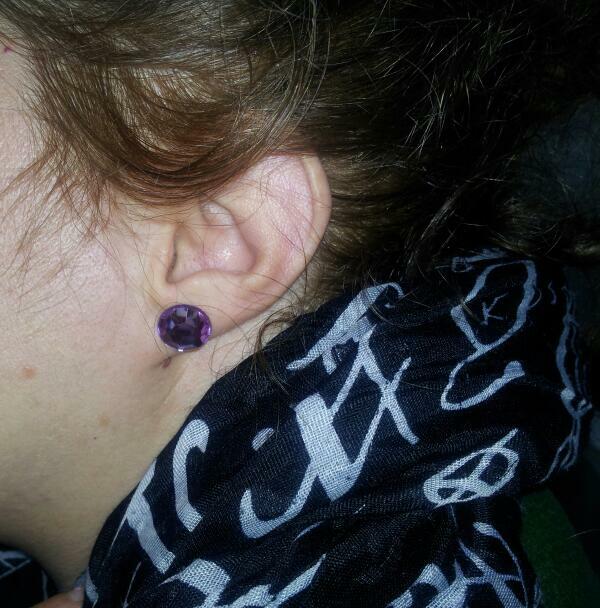 As I admired their beautiful earrings, one of the girls gave me my very own sticker for my ear. I was so chuffed that I wore it for the rest of the day. Some of my older students laughed at me but I thought it was really sweet! I woke up the next day and found it still on my ear. Since then I haven't worn any earrings to school and I've had several questions from both the boys and girls as to where they were! In my main school, I teach an Afterschool phonics class to 4 students - 2 boys from first grade and a boy and girl from second grade. We are working our way through a book (GHI is currently underway) and supplementing that with games, Starfall.com, and other worksheets. One of the boy's Taesan is this teddy-bear of a kid. He is really cute but really mischievous too. I usually have to remind him at least 3 times each class to sit down, listen and be quiet! Nevertheless, this little charmer evidently likes me and my class as he brought a few of his friends around to meet me last week. These kiddos lined up to talk to me (in Korean) whilst Taesan chattered on in English: Hello Teacher. My name is Taesan. What's your name? How are you! Ah, buh, cuh! Apple, cat!...". Whilst I was trying to control the giggles half the kids lett and 3 of the boys, along with Taesan proceeded to the door to my back to peek out at that classmates. I managed to capture a snap of them. You can just tell they are cheeky, right? Since then I've run across these boys on a few occasions and they now shout out to me "ANNYEONG HASEYO!" Now....If I could just get them to say hello in English! So you might think I'm mad but I think that "[I'll] be having twice the fun" as long as these kids stick around! PS The title of this post was inspired by the lyrics of "Let's get together" from The Parent Trap starring Hayley Mills. Also, this song always reminds me of my cousin Al, whose mom, coincidentally, was the one who got my ears pierced!